PETERSON AIR FORCE BASE, Colorado, July 2, 2012 (ENS) – In what Defense Department officials describe as “a prudent measure,” all military C-130 aircraft equipped with the Modular Airborne Fire Fighting System have been placed on operational hold after one of the aircraft crashed Sunday night, killing an undisclosed number of military personnel. A MAFFS-equipped C-130 from the North Carolina Air National Guard’s 145th Airlift Wing crashed while battling a fire in southwestern South Dakota at about 6:30 pm Mountain Time yesterday, officials said. The cause of the crash has not been determined, and the incident is under investigation, officials said. At the time of the crash, the crew was fighting the White Draw Fire near Edgemont, South Dakota. 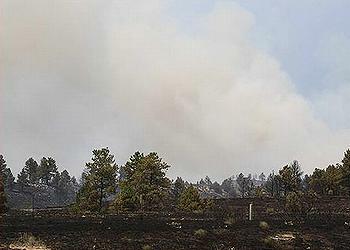 Started by a vehicle on Friday night, the White Draw Fire has charred 4,950 acres and is about 50 percent contained. Evacuations are in effect and structures are threatened. Crews fighting the flames through narrow steep canyons in 90 degree heat were helped by some rain on Sunday. It is not known when the MAFFS aircraft will resume operations, officials said. The crash was the first in the 40-year history of the MAFFS program, a joint Defense Department and U.S. Forest Service program that provides additional aerial firefighting resources when commercial and private air tankers are no longer able to meet the Forest Service’s needs. MAFFS is a self-contained aerial firefighting system owned by the Forest Service that can discharge 3,000 gallons of water or fire retardant in less than five seconds, covering an area a quarter of a mile long by 100 feet wide. Across the country today, seven new large fires started and nine large fires were contained. Still, there are 46 large fires burning uncontained, according to the National Interagency Coordination Center in Boise, Idaho. Last Friday, President Barack Obama approved a disaster declaration for Colorado providing additional support to state and local officials responding to the fires, as well as federal assistance for individuals affected by the High Park and Waldo Canyon Fires. 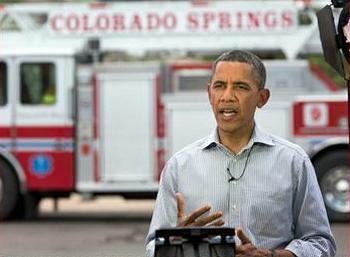 The President visited the scene of the Waldo Canyon fire near Colorado Springs and praised the military-civilian firefighting partnership. “As you saw in the some of these subdivisions, the devastation is enormous. And our thoughts and prayers go out to all the families who have been affected,” Obama said. Today and tomorrow, Secretary of Agriculture Tom Vilsack and Secretary of Homeland Security Janet Napolitano are visiting Colorado and Idaho to survey ongoing wildfire response efforts, thank heroic first responders battling the fires, meet with state and local officials and assure them of theadministration’s support for affected communities. The Forest Service, Department of the Interior, Department of Defense and Federal Emergency Management Agency continue to support efforts to protect life, public safety and aid in community recovery. Earlier today, FEMA approved an additional Fire Management Assistance Grant, FMAG, for the Squirrel Creek Fire in Albany County, Wyoming. This brings the overall total number of FMAGs approved for states during this fire season to 22 in Colorado, Montana, New Mexico, Nevada, Texas, Utah, and Wyoming. Currently, 15 airtankers, not including MAFFS-equipped C-130s, are available to combat fires burning across the West. More than 11,400 personnel, 700 fire engines and 120 helicopters are also fighting wildfires around the country. As part of heightened efforts, on Friday the Forest Service and the Department of the Interior began training an Army battalion at Fort Carson, located near Colorado Springs, to potentially serve as ground firefighters to boost the number of firefighters available on the Waldo Canyon Fire and throughout the nation. Since the beginning of the Waldo Canyon fire, Fort Carson units and services have committed more than 120 soldiers, 10 bulldozers and other equipment and resources to provide assistance to ongoing fire containment operations and interagency support to the Greater Colorado Springs community. Firefighters, in the face of adverse weather and difficult terrain, continue to combat the Waldo Canyon fire and more than 1,580 federal, state and local firefighters, over 90 fire engines and 11 helicopters are fighting the fire today in the hillsides west of Colorado Springs. One resident has died in a burned-out home in the Mountain Shadows subdivision of Colorado Springs. The incident is under investigation. On Thursday, authorities began to allow residents of some Colorado Springs neighborhoods back into their homes, but most areas are still under mandatory evacuation orders. On average, the Forest Service and Department of the Interior respond to about 16,500 wildfires per year that occur on land under their jurisdiction and assist state and local agencies in responding to a significant number of the approximately 60,000 wildfires per year that occur on land under their jurisdiction.